Accelerated access to specialty care. 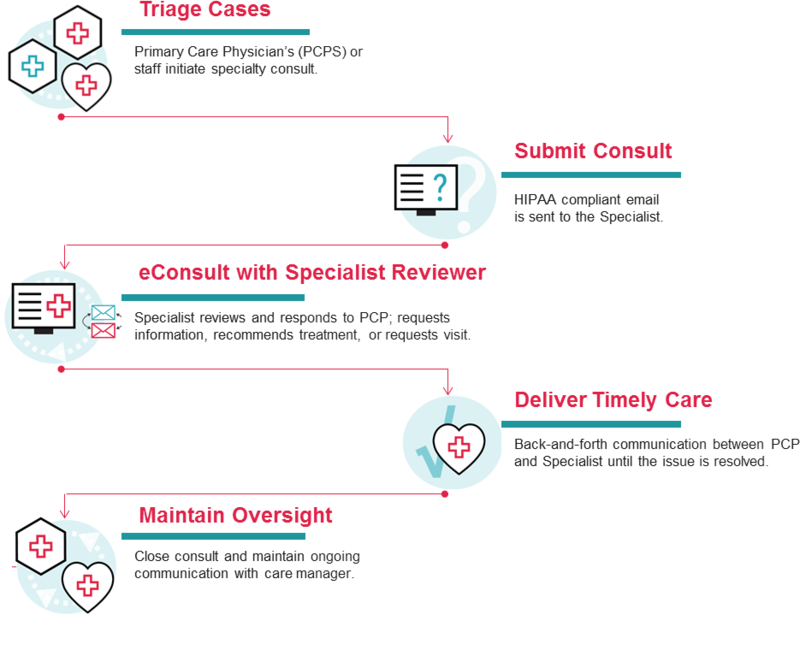 A secure web-based tool that enables primary care providers (PCPs) to quickly and efficiently conduct electronic consultations (eConsults) with specialists regarding a patient’s specialty care needs. Timely, prioritized and effective web-based communication between primary care providers and specialists. A different access point to specialty care using a peer-to-peer approach that allows primary care providers to communicate at their convenience. Enhanced collaboration between primary care providers and specialists, through e-consultations and pre-qualified referrals. Easy to implement and EMR-agnostic — exchanges patient health information, including lab results and clinical images. Reduces unnecessary referrals and no-show rates. Accelerates access to specialists and decreased wait times for appointments. Streamlines electronic communication between PCPs and specialists. Enhances quality of care with better clinical documentation. Enables effective management of specialty utilization rates. Increases patient satisfaction & improved quality of care.